Wavelet Toolbox™ software enables you to analyze signals, images, and 3-D data using orthogonal and biorthogonal critically-sampled discrete wavelet analysis. 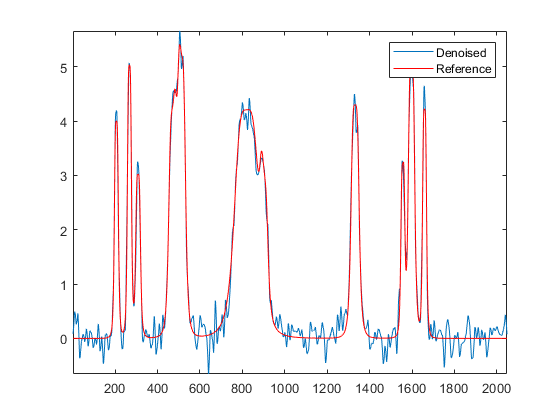 Critically-sampled discrete wavelet analysis is also known as decimated discrete wavelet analysis. 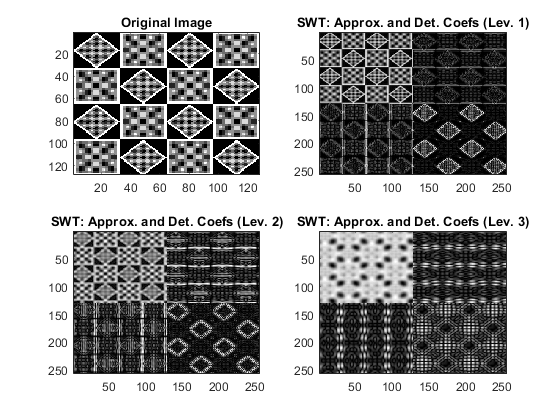 Decimated discrete wavelet analysis is most appropriate for data compression, denoising, and the sparse representation of certain classes of signals and images. In decimated discrete wavelet analysis, the scales and translations are dyadic. You can perform 1-D, 2-D, and 3-D decimated discrete wavelet analysis using the interactive tool by entering waveletAnalyzer at the command line and clicking Wavelet 1-D, Wavelet 2-D, or Wavelet 3-D. 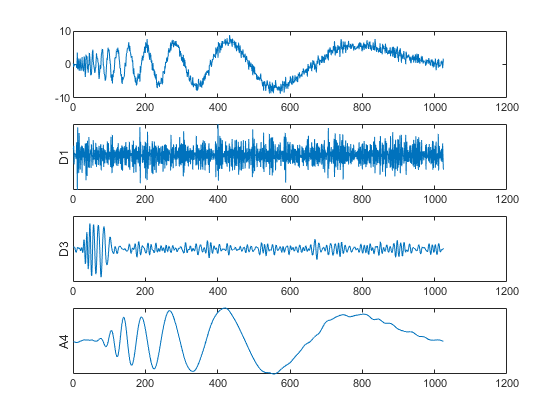 This example shows how to denoise a signal using discrete wavelet analysis. 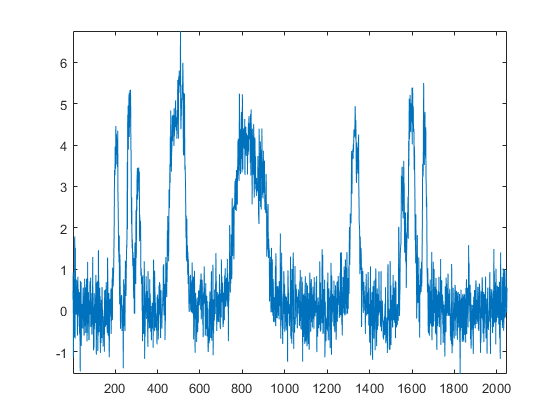 Add zero-mean white Gaussian noise with a variance of 0.25. Denoise the signal down to level 3 using the Daubechies least asymmetric wavelet with 4 vanishing moments. Use the universal threshold selection rule of Donoho and Johnstone with soft thresholding based on the DWT coefficients at level 1. Use the periodization signal extension mode — dwtmode('per'). Plot the result along with the reference signal for comparison. This example shows how to obtain the 2-D DWT of an input image. Load and display the image. The image consists of vertical, horizontal, and diagonal patterns. Obtain the 2-D DWT at level 1 using the biorthogonal B-spline wavelet and scaling filters with 2 vanishing moments in the analysis filters and 4 vanishing moments in the synthesis filters. Extract the horizontal, vertical, and diagonal wavelet coefficients and the approximation coefficients. Display the results. 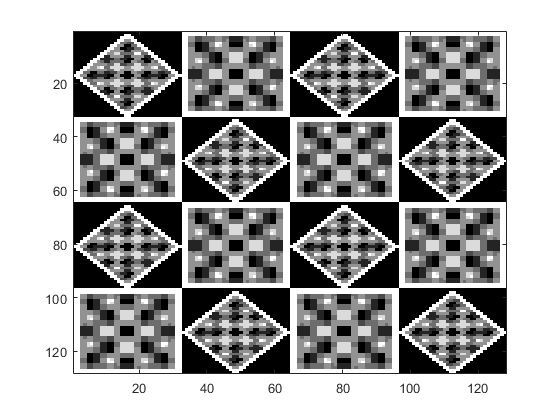 You see that the wavelet details are sensitive to particular orientations in the input image. 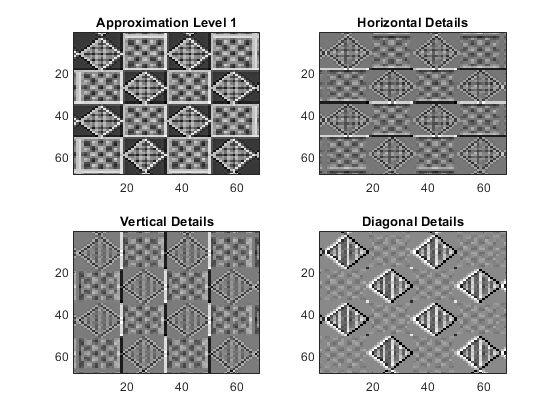 The approximation coefficients are a lowpass approximation to the original image. This example shows how to obtain the nondecimated (stationary) wavelet transform of a noisy frequency-modulated signal. Load the noisy Doppler signal and obtain the stationary wavelet transform down to level 4. Plot the original signal and the level 1 and 3 wavelet coefficients. Plot the level 4 approximation. The wavelet and approximation coefficients at each level are equal in length to the input signal. The additive noise is almost entirely localized in the level one detail coefficients. The level 3 detail coefficients capture the high-frequency oscillations at the beginning of the Doppler signal. The level 4 approximation coefficients are a lowpass approximation to the Doppler signal. Obtain the 2-D nondecimated wavelet transform of an image. Use the Daubechies least asymmetric wavelet, sym4, and obtain the multiresolution analysis down to level 3. Load the image. Use wcodemat to scale the matrix for display. Obtain the nondecimated multiresolution analysis down to level 3. Display the original image and the approximation and detail coefficients at each level.